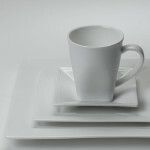 Hot beverage containers and accessories for table service and beverage stations. Coffee percolators require 45-60 minutes to brew. Insulated drink dispenser and thermal carafe for use with hot or cold beverages. Silver plated urn, or samovar, uses 2- 5/8 oz sterno. Sterno sold separately. #6610 $0.79 Iced Tea Glass 15 oz.